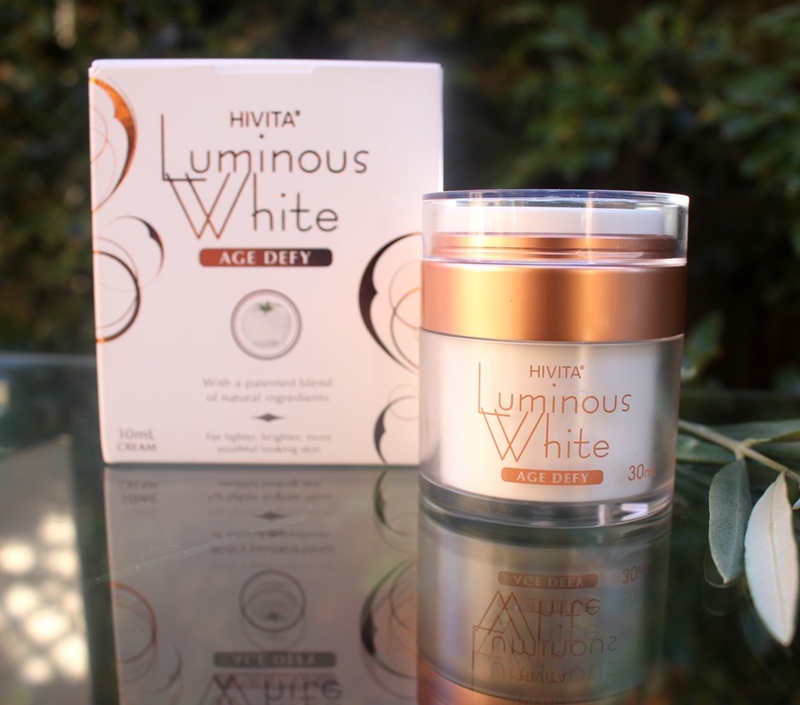 The Hivita Luminous White Age Defy is a luxury moisturiser formulated with a patented blend of 100% natural ingredients to deliver a skincare system clinically proven to decrease pigmentation, reverse sun damage, lighten age spots, reduce wrinkle and protect against pollution. Within a 100% natural formulation, following water which is present at the highest concentration is Jojoba Seed Oil, a unique oil composed of 97% wax esters. This oil/wax resembles human sebum ensuring easy absorption into the skin for superior moisturisation without clogging pores. 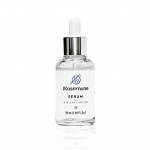 Additionally, this characteristic helps regulate sebum production and balance facial oils. Important for skin cell regeneration, it is rich in natural Vitamin A while essential omega 6 and 9 fatty acids help repair and regenerate skin cells. 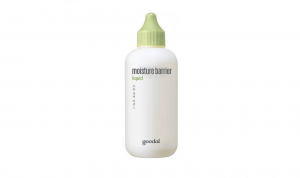 IBR-GAPTURE® is an aqueous extract of Jojoba Leaf able to reinforce skin structure, strength, firmness and cohesion by enhancing the skin’s barrier function and restoring its moisture. 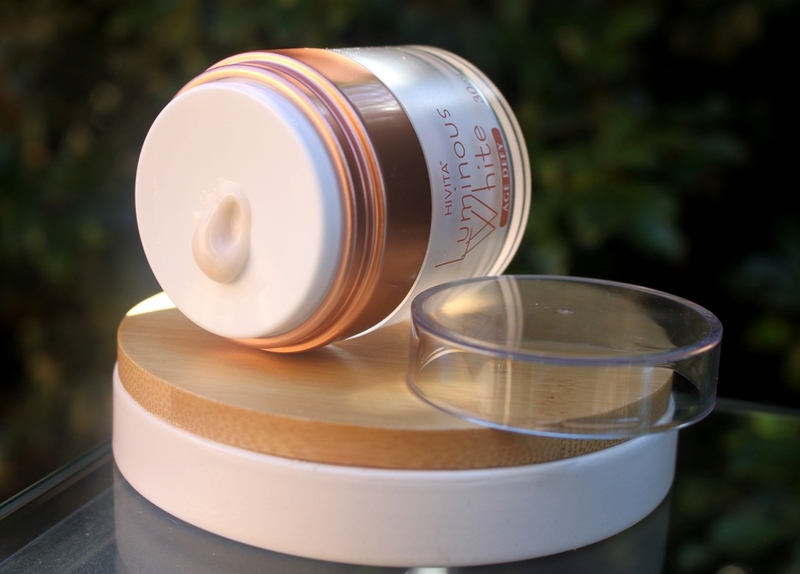 Clinical tests conducted on 3% IBR-GAPTURE® in cosmetic cream substantiated improved skin cell adhesion and smoothness plus reduced trans-epidermal water loss (TEWL), drawing a direct correlation with improved skin integrity, health and vitality. Squalane is an excellent moisturizer, helping to hydrate, plump and soften skin and also accelerating the speed with which cracked and chapped skin heals. 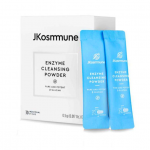 It can also assist to treat conditions such as eczema and psoriasis. Squalane is able to achieve this without greasy residue. Similar to jojoba oil, it is ideal for all skin types and can help regulate excess oil production. Antioxidant properties ensure it protects skin from free radicals and can help fade dark pigment over the longer term. It is also naturally antibacterial. Non GMO freeze dried and specially selected from the Mediterranean, Tomato Fruit Extract is the hero ingredient in the formula. 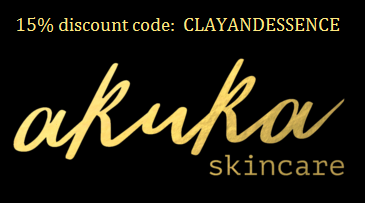 These are said to be rich in carotenoids, namely Phytoene and Phytofluene which deliver unique anti-inflammatory, antioxidant and UV absorbing properties, the latter resulting in skin lightening through reduced melanin production. Antioxidant effects are strengthened by the presence of Lycopene to deliver a strong defense against oxidative stress. Tomato Extract also helps balance skin pH and regulate sebum. Salicylic Acid is a beta hydroxy acid (BHA) that helps shed the inner lining of the skin pore to declog black/whiteheads. 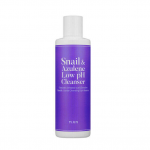 It also acts as a keratolytic, loosening keratin to allow easier shedding of scaly skin. Galactoarabinan (GA) is another gentle exfoliant. Mica is a collection of silicate minerals added to the formulation to contribute a skin glow or radiance and often included in brightening or illuminating creams for this effect. Not surprisingly, Glycerin appears fairly high up in the formula, drawing moisture from the air to the skin. Rounding off remaining ingredients are natural forms of emollients, emulsifiers, conditioning and preservative agents. Aqua, Simmondsia Chinensis (Jojoba) Seed Oil, Glycerin, Cetearyl Alcohol, Mica, Cetearyl Olivate, Galactoarabinan (GA), Sorbitan Olivate, Potassium Cetyl Phosphate, Stearic Acid, Squalane, Benzyl Alcohol, Glyceryl Laurate, Hydroxypropyl Methylcellulose (HPMC), Solanum Lycopersicum (Tomato) Fruit Extract, Salicylic Acid, Disodium EDTA, Lauroyl Lysine, Simmondsia Chinensis (Jojoba) Leaf Extract, Sorbic Acid. The brand proudly announces that the cream is free from parabens, sulphates, ethoxylated propylene glycol, silicones, phthalates, mineral oils, DEA, artificial colours and fragrance and is vegan. 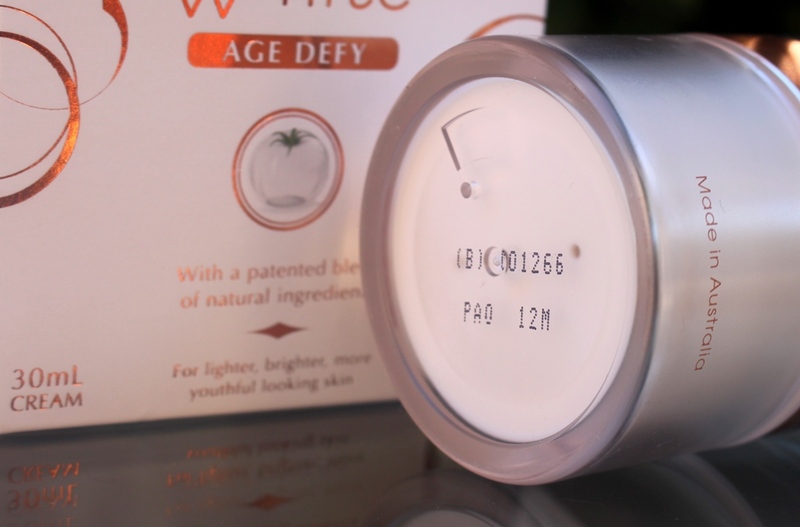 The Hivita Luminous White Age Defy comes in a plastic tub with a press down dispenser and protective cap. 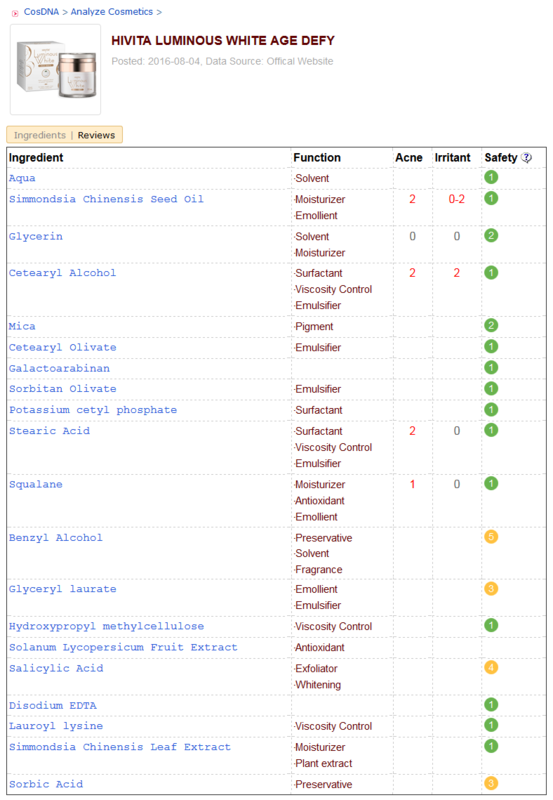 CosDNA and EWG reports return a primarily safe formulation with warning flags raised against Benzyl Alcohol (preservative) and Salicylic Acid (exfoliant). The smell of this product is slight and natural. 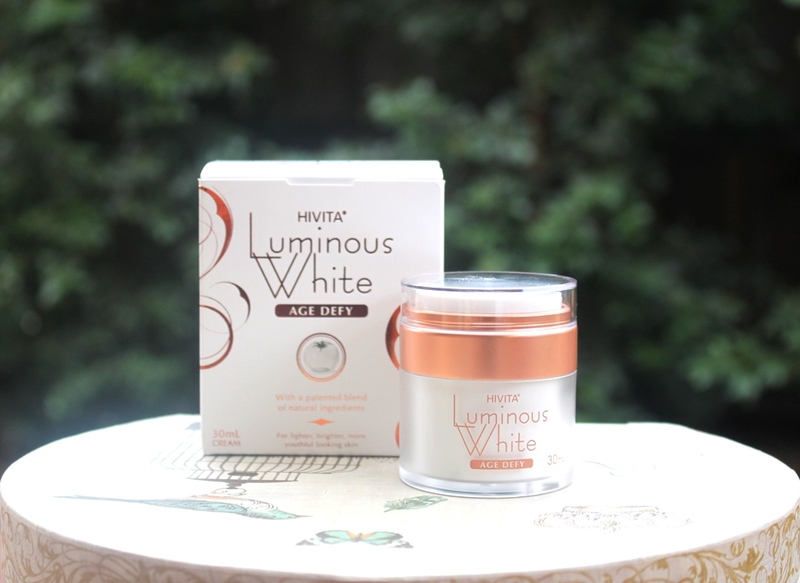 The 30ml jar of Hivita Luminous White Age Defy costs AUD$88.00. 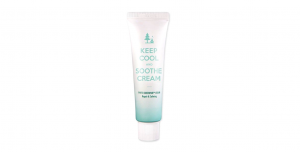 The cream is available from the Hivita website and also from selected pharmacies. The product expires 12 months after opening. 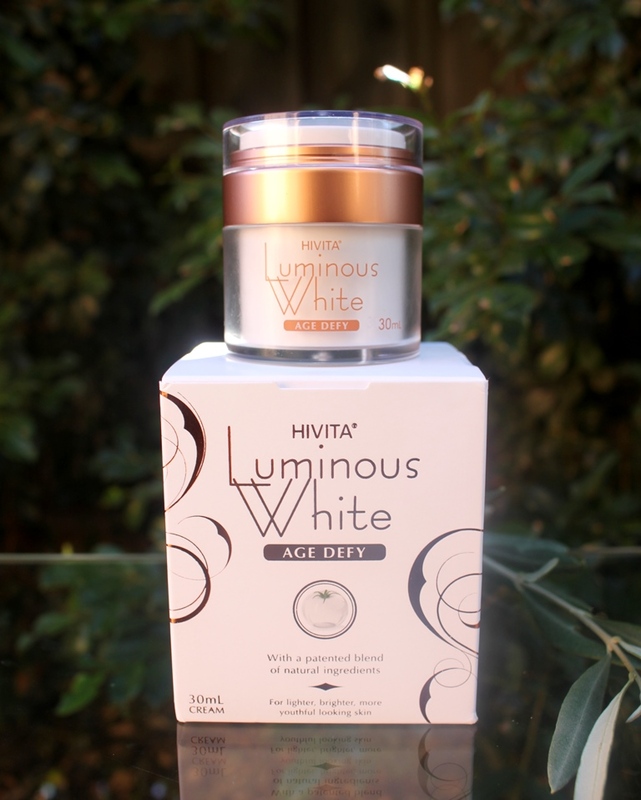 The Hivita Luminous White Age Defy is an Australian made product. I held off posting this review until I had finished the entire jar, applying twice daily, morning and night for a period of around 4 weeks. The cream is elegantly presented with a pump action dispenser assuring hygienic application and protection against air and light exposure. The mild scent is a natural outcome of all the ingredients coming together with no fragrance added to enhance its smell. It reminds me a little of yeast. It’s not strong or overbearing and dissipates quickly. The texture is light, silky and creamy and the colour soft coral. It slides on the skin easily with plenty of slip. A single pump is the perfect amount for generous coverage of the face and neck. 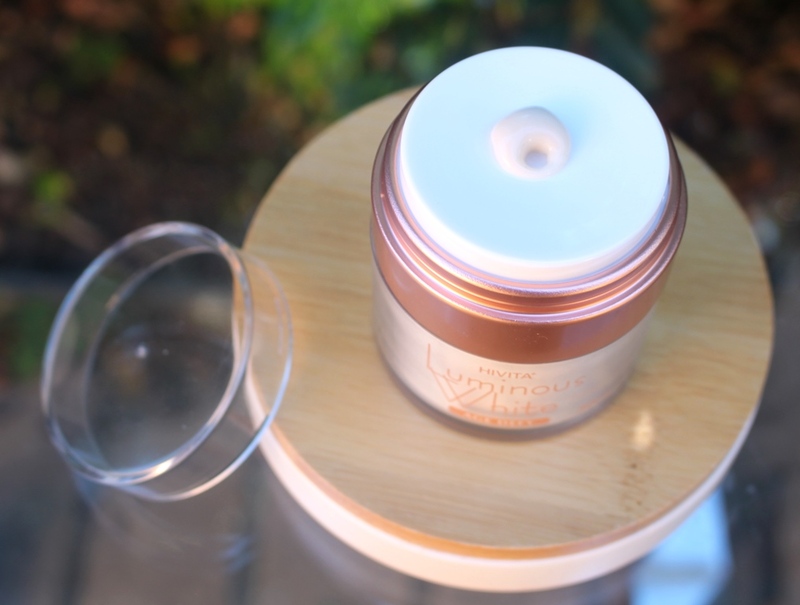 The cream immediately melts into the skin, fully absorbing without the slightest sign of residue or heaviness on the face. 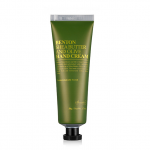 It leaves the skin looking matte and plump, instantly moisturised. Hivita quotes the results of clinical tests which had participants using the cream twice daily for a three month period. My experience involved the same frequency but for only one third of that time. I altered my routine during the course to remove other layers in order to better gauge the results this product was attributing. Hydrating agents, oils and serums were eliminated one by one until my routine basically became the traditional three step cleanse-tone-moisturise. This introduced variance meaning I did not undergo ideal, consistent test conditions. Furthermore, I am unable to quantify the rate of improvement achieved with percentage estimates due to the lack of scientific conditions. This includes an absence of set benchmarks (no formal before status with which to compare after results). 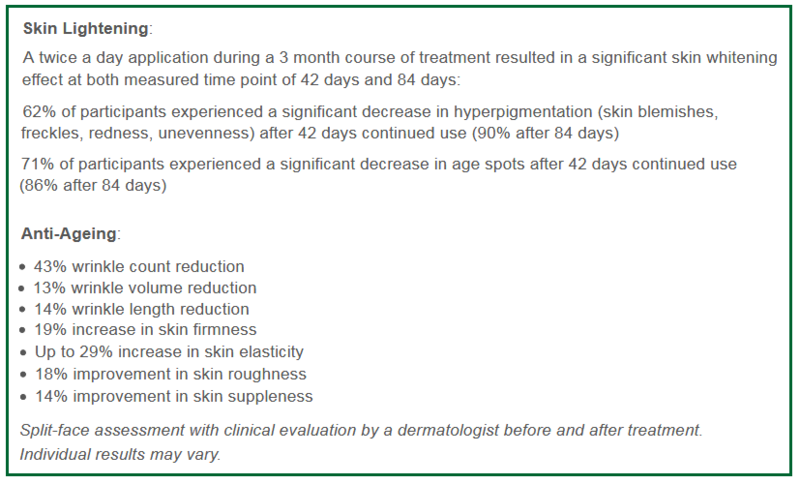 At the conclusion of the 6 week trial, 62% of participants saw improvements in hyperpigmentation and 71% stated their age spots lightened. 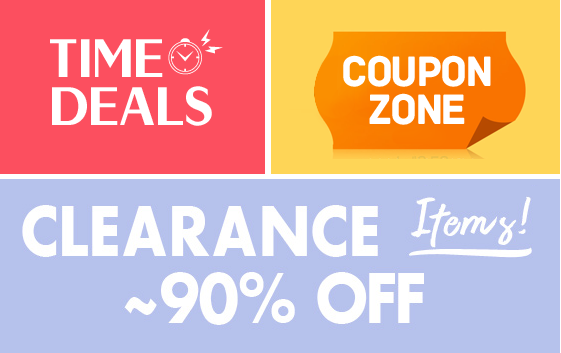 This increased to 90% and 86% respectively after 12 weeks. This supports the assumption that improvements in skin condition increase with extended use. I have a relatively even skin tone, however I do have a few small slightly darker patches, results of sun damage received after years of not sufficiently applying sunscreen in my youth. I have tried many creams and treatments to eliminate these but without success so was not expecting much. After finishing the jar, my tone certainly looked significantly healthier, more even and brighter, however these patches had not visibly changed. (Quite frankly, I would have been surprised if they had lightened). Nonetheless, the resultant tone enhancement was very pleasing, my skin quickly becoming more radiant. Regarding wrinkles, 43% of the test candidates suggested some of the lines completely disappeared while a few also claimed that wrinkles softened. 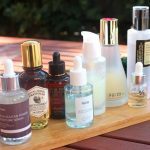 I have been using anti-ageing serums for a long time and eliminating them for the short term didn’t seem to have much impact, indicating this cream must be contributing some level of defense against the signs of ageing since no degradation was observed. Plumping through moisture improvement definitely gave my fine lines and wrinkles the appearance of reduction, making them less prominent. This was particularly visible with my elevens (the vertical frown lines between the eyebrows). Hydration also goes a long way towards preventing new lines from forming and existing lines from deepening. It was difficult to conclude permanent changes. As for elasticity and firmness, I believe there is slight improvement in both skin attributes. I can also confirm texture became smoother and softer, these results felt consistently across my entire face. This was particularly noticeable with known dry (jawline) and oily (T-zone) patches. 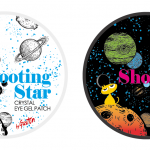 Both had neutralised resulting in a more consistent complexion. 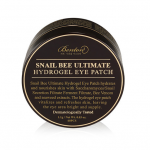 The brightening and anti-ageing effects of this cream would attract all age ranges and skin types. 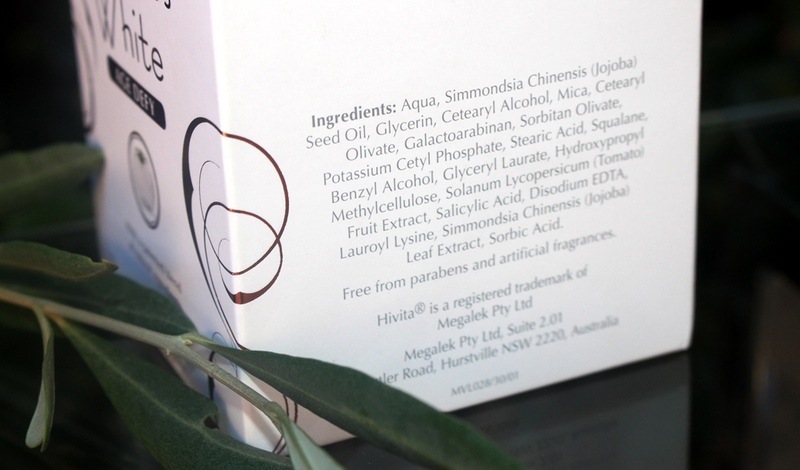 Being a 100% natural formulation free of added fragrance with a total composition of only 20 ingredients, it would likely even suit those with sensitive skin. It is gentle and effective with results visible in only a few weeks. 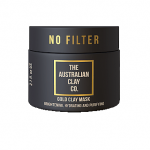 My only criticism of this product is that it is a little expensive, the 30ml jar having a recommended retail price of AUD$88.00 and lasting just 4 weeks with twice daily use. If I was to make it my primary moisturiser, I would reduce application frequency to daily to make it last longer and apply something else in the morning. 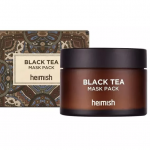 Alternatively, there is also the option to simplify the skincare routine by eliminating one or more complementary products such as hydrating agents, anti-ageing serums and oils, since this cream addresses several common objectives. Thus the cream becomes a multi-tasking layer of the skincare routine, making it far more economical. 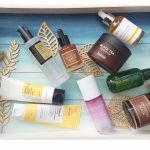 As a skincare blogger however, I am always changing my products through a thirst for new discoveries. This discovery is a real winner! 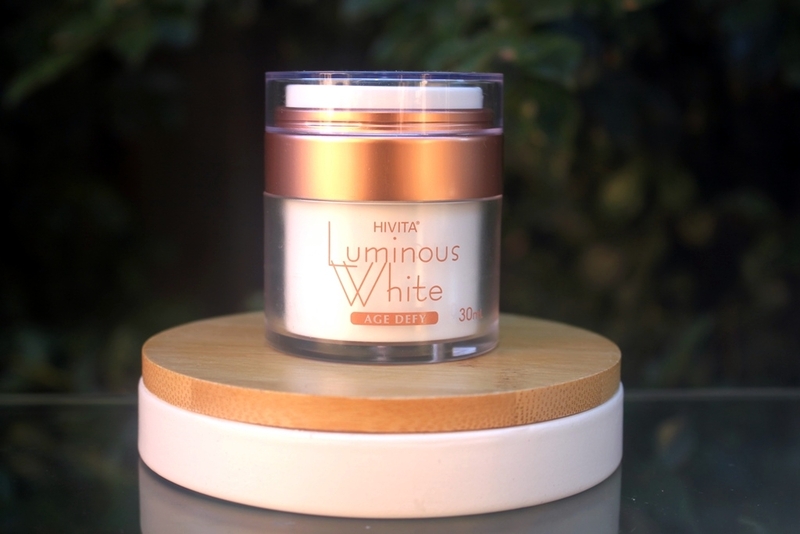 The Hivita Luminous White Age Defy cream surpassed my expectations. It is smooth and silky to apply, absorbs completely and rapidly leaving a matte finish and lives up to its whitening claims. My skin is bright, even, soft, hydrated and looking very healthy. It definitely agrees with me. This is one of the nicest moisturisers I’ve used. 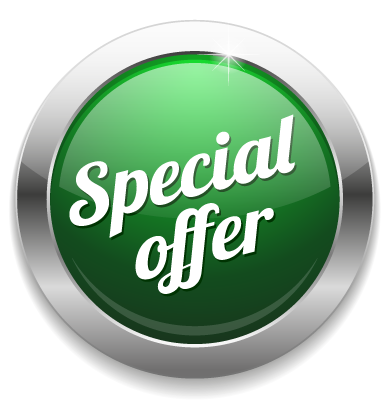 This product was provided to me free of charge by Hivita for review. This post only includes my honest opinion and experience of this product and is in no way influenced by Hivita, any of its representatives or any other third party.